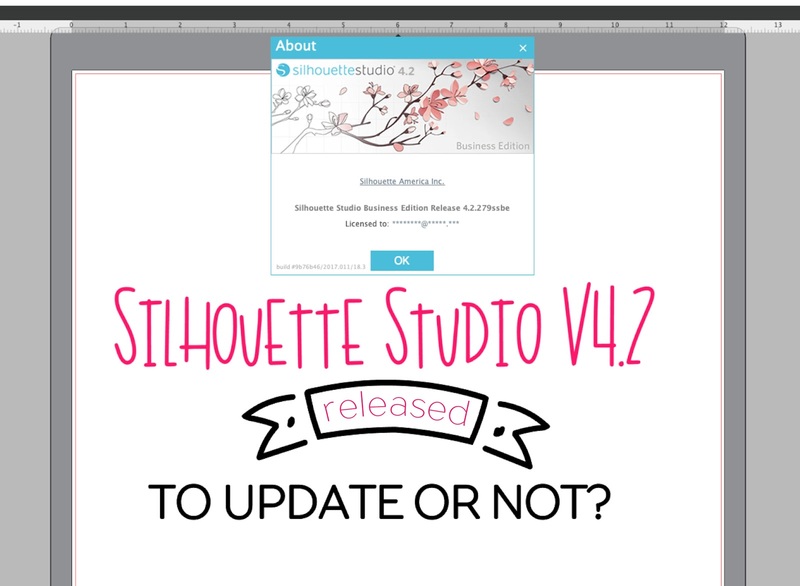 Silhouette Studio V4.2 Released...But Should You Update Yet? The long awaited Silhouette Studio V4.2 has finally been released (out of beta) as the current version of the software which means anyone can download it from the Silhouette America site. However before you do there are a few things you should know...along with my recommendation for updating or not. But before you jump in head first...a few things to know! First, the current version of Silhouette Studio V4.2.279, which was released Monday, was released in both open and closed beta on February 1. That means the beta testers, myself included, have had about 10 days to test it. While this version of Silhouette Studio V4.2 is much more stable than prior versions, there are still some bugs...and I'm sure we'll find more as we continue to use it. Before you decide whether or not to update your software just know what you're jumping into. Most of the bugs are not major - they're more like gnats...annoying. For example, when you copy a design and then go to paste it, the duplicate loses its selection box. This may not be a big deal if you have one large object, but if your design consists of even a few (and let's not even talk about a lot of) of individual pieces...you have to re-select everything to move it away from the original (which it was pasted partially on top of). 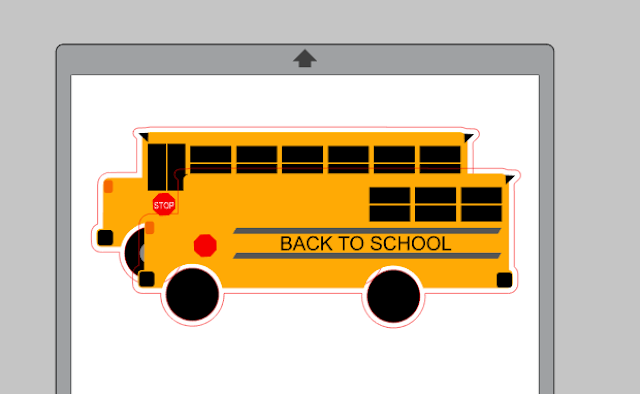 The copy/paste task also pastes the duplicate out of order meaning the back most layers are pasted 'in front' blocking the front most layers. You'll also notice that if you try to get your right click menu it's very finicky. When trying to get the right click menu for a selected object you have to right click directly on the object's cut line (or if it's filled with a solid color on the object itself). This was not the case in previous versions of the software. You used to be able to right click anywhere in the work area while the item was selected to get the right click menu. Now if you right click anywhere the objects become deselected and you end up down a rabbit hole...or I did. The print bleed option is great in theory...but like I pointed out months ago when I first shared a tutorial on using the print bleed for print and cuts, the software still lacks any type of preview. This is going to create an issue when objects are positioned close together. 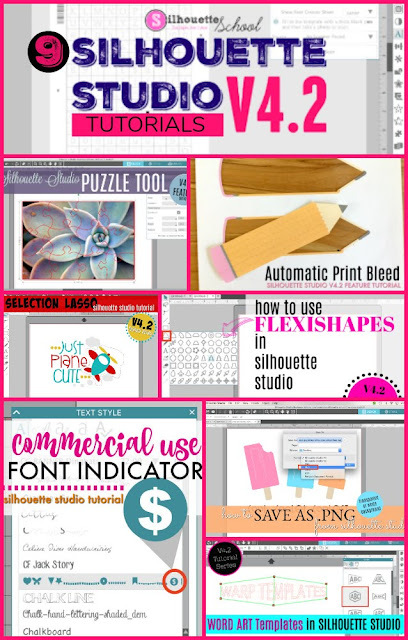 Aside from the newly added features of Silhouette Studio V4.2, which I have detailed in depth in our V4.2 Sneak Peek Series, the library saw the biggest changes. In fact it continues to be tweaked. It is also going to require a lot of education and explanation. The biggest change is you'll notice there is no longer a separation between Local User folders and Cloud folders. Instead all of the folders and sub folders are now under one big "Designs" folder. Each design has an icon under it - either a red X, a gray lock, or a green check mark. The gray lock is on Silhouette Design store files. The red X is the files that were previously in your Local User folder. The green check mark is on files that are on the cloud. 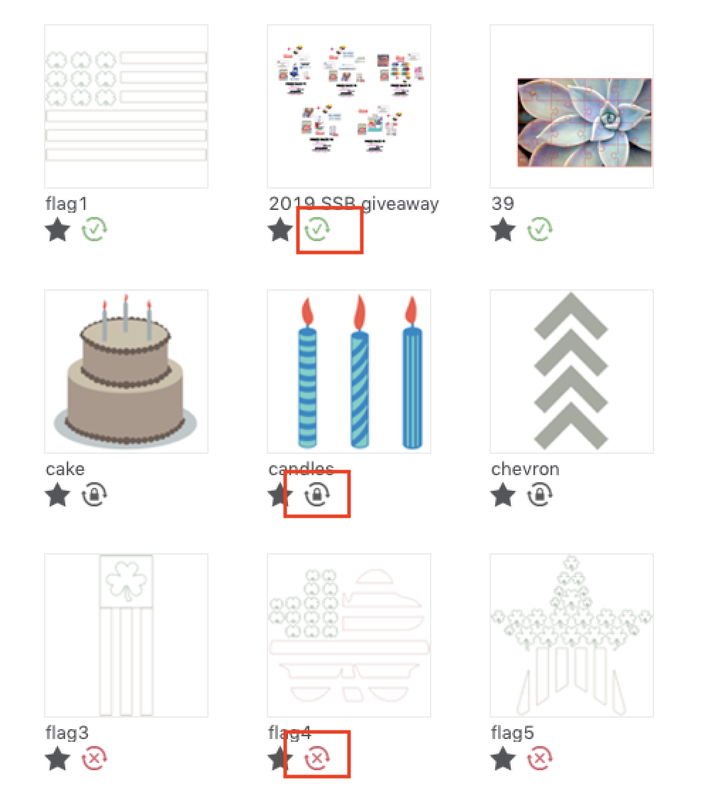 You can toggle between the red x and green check mark designs to move the files between the local user (computer) and the Silhouette server (cloud) accessible on any computer where you signed into your Silhouette America account. At this point I would still suggest you hold off on full updating to Silhouette Studio V4.2 especially if you're not an experienced user. I will say it's getting closer to what I would consider a consistently usable, safe, and stable version - but it's not quite there yet. If you are ready to jump right in and update to Silhouette Studio V4.2 I would highly suggest you back up your library first.